If you’re a potential new follower, I really appreciate your interest in my blog, but this account will be dormant indefinitely. If you’re a current follower, and you stumbled across this post and are wondering how the heck you missed it, I backdated it by about 2 weeks. Big fusses and melodramatic goodbyes are not my thing. I chose not to delete my account because I thought it was terribly inconsiderate when others did that in the past. Deleting your account strips away the likes and comments you’ve given to another people, and it leaves big, gaping holes in the message forum discussions you participated in. There isn’t any single reason why I’ve chosen to leave BL, but it’s been a long time coming. Last year, when the staff was ignoring us and the site was barely functional, I started putting more focus on other sites. The end result is that I’ve become a little more invested in those other sites and a lot less invested in this one. When your entertainment isn’t fun, it’s time to reassess how you’re spending your time. I posted a note at the top of my Follower Comparison and Boolean Shelf Search tools on October 1 with a three-month warning. On January 1, 2018, or shortly thereafter, I will be taking them down. I don’t think many people were using them anymore, and I pay a monthly fee to have them hosted on servers. I wish everybody the very best! I can’t seem to muster up any strong opinions about this book. I enjoyed it fairly well while I read it, although I did get restless at times, particularly toward the end. I could find things to nitpick about, but there wasn’t anything that drove me particularly nuts while I read it. This is just a big mixture of tropes from both the science fiction and fantasy genres and, maybe to a lesser extent, from the romance genre. In the beginning, we're introduced to two young children who have grown into adulthood after the first third of the book. Patricia has skills and interests that fall more into the fantasy realm whereas Laurence has skills and interests that fall more into the science fiction realm. We see the individual paths each character takes and the effect their respective, and often conflicting, approaches have on their own lives and on the world itself. I liked the main characters, and I liked the story pretty much. I just don’t think this is one that’s going to stick with me much. The ending was a little nebulous. It didn’t wrap everything up in a neat bow, but that isn’t really what I’m talking about. The things that happened at the end were those types of events that seem to make sense while you’re reading about them but, when you switch your brain back on afterwards, you realize they don’t stand up to scrutiny very well. I’m giving the book 3.5 stars on the sites that accept half-star ratings, and rounding down to 3 on Goodreads. Slade House by David Mitchell. I read the author’s Cloud Atlas a couple years ago and liked it quite a bit, but I haven’t yet read any of his other work. I don’t know much about it, but I do vaguely remember seeing some reviews quite some time ago that made me want to read it and I grabbed it when the Kindle edition went on sale recently. From what I remember, I think this is supposed to be a little creepy? I thought it might be an appropriate October read. 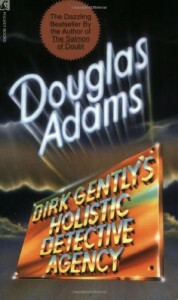 I didn’t enjoy this nearly as much as Dirk Gently’s Holistic Detective Agency. It started off interesting, but for some reason I became progressively less interested as the story continued and I put the book down more and more frequently. I also didn’t find it as funny. It had humor, but it didn’t make me laugh as much. I think it intentionally took a more serious tone, which I might have appreciated better if I’d been more interested in the story. The first book had a mixture of elements from both science fiction and fantasy, but I thought it leaned more toward science fiction. This book, on the other hand, was purely in the fantasy category with Norse gods playing a large role in the story. In many ways this reminded me of American Gods, at least in terms of the basic premise, except without the “American” part. This book was published first, so maybe I would feel differently if I had read it first, but I preferred American Gods. I’m not really sure why this one didn’t work as well for me as Dirk Gently did but, by the end, I was happy to be done with it. 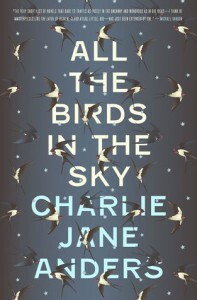 All the Birds in the Sky by Charlie Jane Anders. I don’t know anything about this story, but I’ve seen it reviewed quite a bit in recent months and I’ve skimmed those reviews for general impressions. My general impression of other people’s general impressions is that a lot of people hate it and a lot of people love it, so it will be interesting to see where I end up. I liked this a lot more than I expected to. I had read the author’s Hitchhiker’s Guide to the Galaxy about 20 years ago and, while I remember finding it mildly amusing and clever at times, I also found it too unrealistically silly to take seriously and didn’t much care for it. My memory of that book is too fuzzy for me to say if this book is significantly different in style, or if I’ve just become more tolerant of the type of humor. I do think Pratchett’s Discworld series taught me how to enjoy silly books now and then. This is a science fiction story, set mostly in the present day on our world at around the time it was published in 1987. A computer programmer named Richard seems to be having a lot of strange things happen lately. There’s a couch stuck in the stairwell to his flat that nobody can figure out how to move up or down, he has an odd visit with a former university counselor, and a rather shocking experience while he’s driving, and so on. If I attempt to give any more detail than that, I think it would spoil the story. There are a lot of different elements packed into a fairly short book, but it was all coherent and easy to follow for the most part. I did think the resolution was very fuzzy. I understood the gist of it, but I think it was stretching things a little and failed to take into account other possibilities. Overall though, I enjoyed the book and I loved the humor. 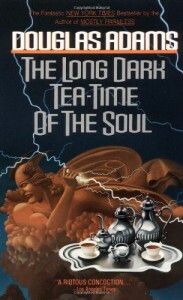 I have the above book in an omnibus which includes the sequel, The Long Dark Tea-Time of the Soul, so I’m moving on to that next. Listen up, people. The author of this book has sent his story to us back through time to help us prepare for the coming apocalypse. His message is this: After the apocalypse there will be no more quotation marks. Commas and apostrophes will be in short supply. Periods will outlast them all. Please use punctuation sparingly and recycle when possible. Ok, I’m joking. Sort of. The above paragraph was triggered by the odd punctuation choices the author made. More on that later. This is a post-apocalyptic survival story in which “the man” and “the boy” travel, more or less, down a road toward the southeast part of the U.S. Some sort of major catastrophe, the source of which is only hinted at, has blocked the sun, destroyed most life, and left ash coating everywhere. The story is basically about their travel down the road, the dangers they face, and their relationship with each other. This book doles everything out sparingly – prose, dialogue, world-building, and even punctuation. I guess that was the purpose to the missing punctuation; it was an attempt to fit with the style of the writing itself. I couldn’t find any deeper message to it, anyway. It was a little distracting at first, but it wasn’t usually too difficult to follow, especially since there were usually only two characters. The dialogue sometimes consisted of several short lines of one to five words each running down the page, alternating between the boy and the man. It’s one reason the book was such a fast read; there just weren’t that many words on a page, especially not during the sections of dialogue. I kind of liked the dialogue, though. I felt like there was a lot being said with those few words, that they knew each other so well that they didn’t have to express themselves verbosely to get a point across. The spare world-building bugged me a little, though. We don’t even know the boy’s age, or how long it’s been since the apocalypse, or what exactly happened, although we do get some hints on the latter. We don’t know how widespread it is. We don’t know how people survived the initial event, or why so few did. The book seemed to be about conveying an experience, and a relationship, and it did so in a very impactful way, but the story itself wasn’t very satisfying to me. It was a quick read that held my attention, but I wanted more meat. 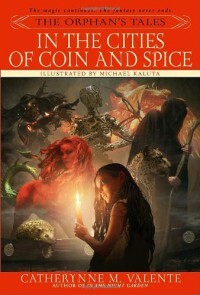 In the Cities of Coin and Spice is the sequel to In the Night Garden by Catherynne Valente. The books share the same structure, with stories nested inside of stories, up to seven levels including the framing story. As for that framing story, it continues in this book and finally gets a satisfying conclusion. I enjoyed this one as much as the first one. The format has lost its newness factor, though; at this point it feels perfectly normal. It also didn’t seem quite as complexly structured as the first book, but maybe that’s just because I was so used to it. It seemed like the stories were more concentrated in a couple layers. As before, the stories were interconnected. There were also a <i>lot</i> of ties back to the first book, some obvious and some more subtle. The stories themselves were darker than in the first book, especially in the first half, and I think I liked them a bit better. I did still occasionally lose interest in some parts, but not too much. The author wove everything together from both books in a satisfying and intricate way. I suspect a reader would enjoy the series as much if not more on a re-read, because the conclusion sheds new light on everything that happened before. 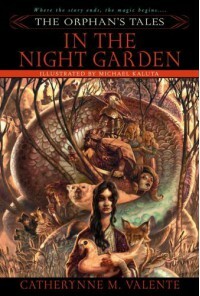 This was my first time reading anything by Valente, and I was impressed. I’ll likely try more of her work in the future. 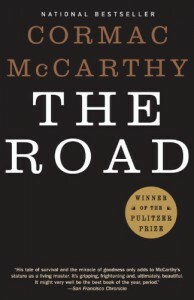 The Road by Cormac McCarthy. I don’t know anything about this book, but I vaguely remember seeing comments that left me with the impression it would be pretty dark and/or bleak. I thought this was a very clever and unique book. At least, I’ve never read anything like it. It tells a lot of stories, I couldn’t say how many, but definitely more than a dozen. However, this is not an anthology. It’s layer upon layer upon layer of related stories nested inside each other. The framing story is about a lonely girl who people shun because they believe she’s a demon. A curious boy approaches her and, over the course of a few days, she tells him two stories. Each of the two stories takes up about half of the book. Within each story, some of the characters tell other stories. Within those stories, somebody tells another story. These stories often tell the backstory of a particular character, so you’re sort of gaining more and more history, going backwards in time as you go forward in the book. Periodically, the book returns to the higher layers to continue those stories, and then it possibly goes back into the same lower layers to finish incomplete stories there, or else it starts a new inner story with a new set of layers. Some of the different branches were only moderately related, but there were lots of little connections here and there which were fun to watch for. Sound confusing? It really wasn’t. The first main story never went more than 5 layers deep. The second main story went up to 7 layers deep a couple times. When I first realized the structure of the book, I was a little worried that I would get confused, so I started checking myself each time the story went into a deeper layer, recounting to myself the steps that had led there. I was always able to do so quickly and without confusion, and I think that process helped me keep it all straight in my head. I could see where some people might find this book disorienting, though. For me, it may have helped that this type of thought process is part of my day job as a programmer; I kept making comparisons to it while I was reading. Reading this was kind of like keeping track of the call stack while reading or debugging a program as it progresses forward and backward through layers of subroutines. The stories all borrow heavily from fairy tales. This was especially noticeable to me since I had read through The Complete Grimm’s Fairy Tales earlier this year. It really isn’t a retelling of any of those stories, but there were lots of little nods, sometimes with similarities and sometimes with twists, and with the tiniest hint of satire. Unlike many of the Grimm’s tales, however, this book was internally consistent, the characters’ actions made sense, and it never felt silly. I do still have a little bit of Fairy Tale Fatigue from the Grimm’s book though, so that might have impacted my enjoyment of some of the stories. Some layers were more interesting than others, so the book didn’t always hold my interest, which is the main reason I’m not rating it higher. In the Cities of Coin and Spice by Catherynne M. Valente, the sequel to this book. This was the last book in the series The Book of the New Sun. For the most part, I really liked it, and I might even have rated it higher than the four stars I’ve consistently given the other books in this series. However, I thought it went off the rails a bit toward the end. It gave me the answers I was looking for in terms of what happened after the end of the fourth book, and I enjoyed the story it told. Then, without giving anything away, it shed new light on many of the events from those first four books, and gave more meaning to them, and I also really enjoyed that. Some things were spelled out, but others were quite a bit more subtle, and I enjoyed catching the various references. My problem was that I thought the author went too far with it by the end. Just as I was admiring the cleverness, he took things a few steps further. I felt like, in an attempt to keep things twisty and complicated, he robbed it of some of the meaningfulness. Kind of like a cook who can’t stop tweaking his recipe until it doesn’t taste quite right anymore, or a painter who keeps adding “just a bit more” to his design until it’s no longer quite as pleasing to the eye. A smaller complaint I had with the series in general is that, since the story centers around Severian, there are some characters who play a large role in the series but for whom we don’t get much closure because their paths diverge. There was one character in particular that I really wanted more follow-up on, especially considering how often he was remembered and referenced in Severian’s narrative. Over all, though, I enjoyed this series quite a lot. I liked that it wasn’t simple or straight forward, and I liked its unique (in my experience) blend of some of the best elements from both science fiction and fantasy. For now, there are many other authors and books I’m interested in trying, but I’d like to cycle back around to give Wolfe another try sometime down the road. 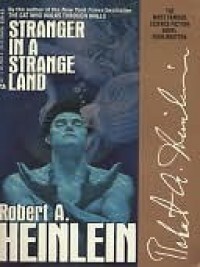 Stranger in a Strange Land by Robert Heinlein. This will be my first time reading Heinlein and I’m not too sure what to expect. I have a variety of nebulous impressions based on comments I’ve seen here and there, but now it’s time to find out for myself. This is the fourth book in the series The Book of the New Sun. There’s still one more book, but this was the conclusion to the main story arc that our main character, Severian, has been telling us. This review is therefore more of a review of the first four books as a whole than it is of this fourth book in particular. I’ve enjoyed this series quite a bit. It’s an interesting mix of genres. It was clear from early on that this was really science fiction, and that becomes increasingly apparent as the series progresses, but the setting feels more like a fantasy setting and the story-telling method makes it feel more like an epic fantasy story. The story is a bit complicated. Maybe complicated is the wrong word, because it really isn’t difficult to follow or understand, but there are a lot of little bits and pieces that we’re introduced to separately. We have to weave some of those pieces together for ourselves to understand the bigger picture, and we have to be paying attention once the narrator finally weaves some of the other pieces together for us. I’ve seen several people say the series improves with re-reading, and I can definitely understand how that would be true. I felt like I grasped most of it, but I’m sure I missed more things than I realized and would understand other things more deeply if I ever read it again. This isn’t a series to pick up if you’re in the mood for a light read, but it’s a good one if you want something you can sink your teeth into. Despite my above description, I wouldn’t necessarily call this a twisty series. On the one hand, the story ended very, very far from where I ever would have guessed based on its beginning. On the other hand, the foreshadowing is pretty blatant. There were surprises, but nothing shocking. Severian, our narrator, gives us small hints here and there, and he also flat-out tells us some things in advance. In other cases, he recounts conversations in which somebody gives him answers, but he somehow fails to grasp what he's told because it’s so contrary to what he believed to be true. So he ignores what he's told and continues to carry on as if his own beliefs were true. Then, later on in the narrative when he “discovers” the thing he had already been told and recounts it to us, he acts like we the reader should be as surprised as he was. Severian claims a few times that he’s not particularly intelligent, and I frequently agreed with him. :) Still, while he exasperated me a few times throughout the series, and occasionally did things I disliked very much, he also grew on me and I mostly enjoyed reading his story. This book wrapped things up pretty well, although not in a neat bow for sure. Severian himself speculates about explanations for some of the things he never found definite answers for, and sometimes his speculations made me question things I had thought I knew the answers to. There’s also a pretty big “What happens next?” question at the end, as Severian’s life has recently taken a brand new twist and he has an upcoming task that sounds pretty interesting. I might have been a little exasperated if this had been the last book, so I look forward to reading the fifth book to hopefully find out where things go from here. 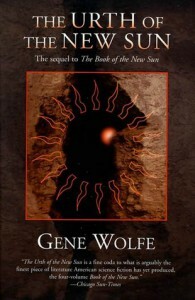 The Urth of the New Sun by Gene Wolfe, the fifth and final book in this series. I did really like Little Severian and the brief period in which our Severian takes on the role of his father. The boy’s death really caught me by surprise. I guess it was supposed to be ironic that at one point Severian muses that he isn’t sure which he was more worried about losing, the boy or his sword, when he’s climbing up mountains with both on his back. By the end of the book, he’s lost both. This book continues to create more questions, but it also answered or hinted at answers to quite a few things. On to the fourth book! 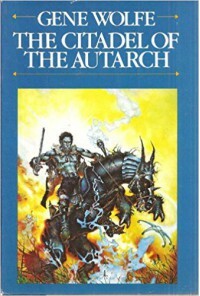 The Citadel of the Autarch by Gene Wolfe, the fourth book in this series. This is the second book in the series The Book of the New Sun. I liked it at about the same level as I liked the first. I was particularly wrapped up in the story for the first half or so, but my interest started to fade a little toward the end. One of the sections near the end that I really had trouble getting through was the play. There’s a fairly large chapter in which we’re given the script for a play that is performed. I’ve never been crazy about reading things in that format to begin with, and it didn’t help that I wasn’t prepared for it and that I reached that point in the book last night when I was exhausted after my 19th straight day of work. I ended up putting the book down, going to sleep, and then backtracking a few pages to read the play from the beginning this morning. I was able to follow it better after some sleep, but I still didn’t particularly enjoy it. One other thing that got on my nerves was Severian, the narrator, continually reminding the reader that he doesn’t forget anything. I wish he could just remember how many times he’s told us that and stop telling us! If the reader doesn’t understand the implications of this by now, they’re never going to, so please stop torturing the rest of us. Really though, I did enjoy this book, despite a few annoyances. I particularly enjoyed one of the characters who was introduced near the end of the previous book and played a large role throughout much of this book. I’m hopeful we’ll learn more about him as the series progresses. There were some interesting hints and revelations about him throughout this book. Things got really strange at the very end, so hopefully the next book will pick up with that and clear things up. However, the second book left a gap after the end of the first book and that gap is only vaguely filled in as the reader progresses through the second book, so I’m not particularly optimistic that I’ll get any quick answers. It’s an interesting series, though, with a pretty unique style. 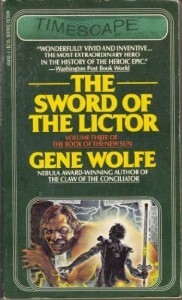 The third book in this series, The Sword of the Lictor by Gene Wolfe. So the above paragraph probably explains why this book felt a little disjointed to me. I’m pretty sure it was me who was disjointed, rather than the book. Usually though, once I picked the book back up, I had no trouble with remembering what had happened before or with getting back into the story again. It grew more entertaining as it progressed, but it held my attention well from the beginning. I do think the narrator had a tendency to stop at some odd spots and skip over things I was interested in reading about, though. This reads very much like epic fantasy, but there are some hints from the very beginning that this might actually be more of a science fiction setting. In any case, as is common with epic fantasy, we start with off with a character whose life is soon dramatically altered from what he had anticipated. The main character is Severian, and the book is told from his first-person perspective. It's told in the form of a written history and he occasionally speaks, or rather writes, directly to his readers. He is a young man when we meet him, and an apprentice to the Guild of Torturers. He’s grown up with the guild from his earliest memories. Beyond that, I can’t say much about the story without spoiling it because it takes a little while to move from that point. This book is not at all as gruesome as one might expect based on the title, although it does have a few moments. I also think that, in my experience, this book is pretty unique both in terms of both style and story. If the word “torturer” makes you immediately think of Glokta from Abercrombie’s First Law world, there is little if any similarity between the characters. I never formed a definite opinion about Severian. He was a bit of a contradiction. He’s compassionate in some ways, harsh in others. Sometimes he made decisions that I agreed with, and yet his motivations for those decisions were often questionable. He also had a tendency to “fall in love” with every pretty face he saw. Obviously he’s had a weird upbringing, so much of his behavior can be explained by that, but it did make him a little difficult to enthusiastically root for. As I was warned, this book does not remotely tell a complete story. It just tells one phase of the story, with no real resolution to events begun much earlier on. I was planning to read the entire series anyway, at least for as long as I continue to enjoy it, so I’m moving on to the second book right away. 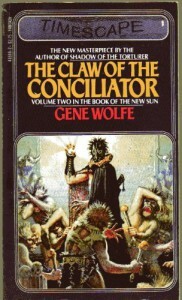 The Claw of the Conciliator by Gene Wolfe, the second book in this series. Ok, I think I’m traumatized now! Believe it or not, I read this book for the first time without knowing much about the story or anything about how it ended. There was enough foreshadowing that I felt pretty sure something horrible would happen by the end, but it ended up being a bit beyond what I had expected. I really enjoyed reading it, though. This is probably one of the more accessible classics I’ve read, and not just because it’s so short. The story quickly captured and held my interest, and I could sympathize with the characters. Steinbeck did a great job of making the characters’ motivations clear without spelling everything out in excruciating detail. I felt like I understood exactly how and why everything happened the way it did. This could easily be read in a single sitting, although I read it in three. I started it late last night, and then I read a little more while I was eating breakfast in the hotel lobby. (Yes, I’m on yet another business trip.) Thank goodness I didn’t finish this while I was eating breakfast. I’ve never tried it before, but I suspect bursting into tears over one’s oatmeal would draw strange looks. I finished it later in the evening, safely tucked away in my hotel room. This book is not safe for reading in public places. This was my first Steinbeck read. It may take me a while to cycle back to him, but I’d definitely like to try some of his other work in the future. 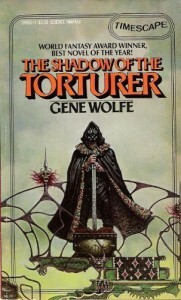 The Shadow of the Torturer by Gene Wolf. I liked some aspects of this book, and the story held my interest, but for some reason I didn’t completely connect with it. This is a fantasy story set in the “real world”, in the present day. The basic premise, at least so far as we understand it at the beginning of the book, is that several orphaned children are adopted by a powerful man they call Father to be apprentices. They live in a ginormous library, and each child is assigned to a different “catalog” that they’re supposed to study. 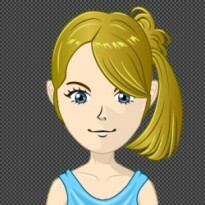 Our main character, Carolyn, is assigned to the catalog of languages. This isn’t a normal library, though; it’s full of knowledge that teaches them abilities that would seem magical to a normal human. The story is a bit non-linear and a little twisty, which I enjoyed. I takes a while before all of the layers are revealed. It’s also darker than my description makes it sound. Father’s teaching methods aren’t very nice. The children are mostly adults throughout the story, except in some of the flashbacks, and they aren’t very nice either. I didn’t have any trouble with that aspect of it, but I would not recommend this to anybody bothered by reading gruesome descriptions, violence, or harsh language. I think I enjoyed the book more in the beginning when I was still figuring out what was going on. The revelations as the story progressed were interesting, but they just made me like the characters less and I also thought some events felt too contrived, even within the context of the story. I never really connected with any of the characters, and I also felt disconnected from the humor. Sometimes the book made me smile or laugh, but there were more times when I would recognize that something was supposed to be funny but not feel the humor. I’m not usually that hard to please when it comes to humor, but for some reason I just didn’t really connect with it in this book. So this was moderately entertaining for me, but I didn’t enjoy it as much as I had hoped I would. 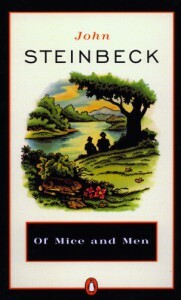 Of Mice and Men by John Steinbeck, my classic selection for the third quarter. 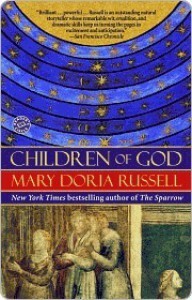 Children of God is the sequel to The Sparrow which I loved. I liked this one a lot, but not quite on the same level. In the first book, I was addicted to both the characters and the story. With this book I was still addicted to the characters, and I did enjoy the story, but I wasn’t as thoroughly caught up in it. The format is similar to the first one. We have two main time periods set several years apart, each of which continue from where the two main time periods in the first book left off. There’s also a third time period that we see only occasionally, taking place further in the future. In the first book, the mystery of how we got from point A (the earlier time period) to point B (the later time period) was a large part of what held my interest. In this book, the story was more straight-forward despite the different timelines. They were more like separate stories that converged, rather than two ends of the same story as in the first book. There were some surprises, and it held my interest well, but I wasn’t reading it with that same desperate desire to fill in the missing pieces. Some of the new characters introduced in the book were less likeable, although I did love how the author gave some of the characters more shades of gray. I think there were arguably more complex characters in this book, and I liked that. I also liked that we got to know some of the characters on the alien planet better. On the other hand, I missed the banter and fun that appeared more frequently in the first book. I guess this review is more a comparison of the two books than a review of this book on its individual merits, but it’s hard not to compare them and it probably wouldn’t be a good idea to read this book without having read the first one. The author does provide the necessary back story, but I think the emotional buildup from the first book goes a long way toward creating the investment and interest necessary for this book. I probably would have rated this lower if I hadn’t read it straight after the first. I’m giving it 4.5 stars on the sites where I can give half stars, but I had a very hard time deciding whether to round up or down on Goodreads. I decided to round up, based on my enjoyment level as I read it. 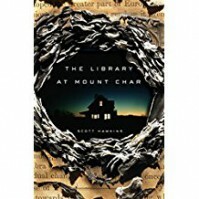 The Library at Mount Char by Scott Hawkins.